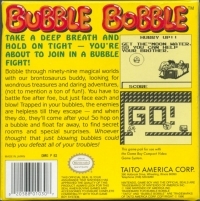 TAKE A DEEP BREATH AND HOLD ON TIGHT - YOU'RE ABOUT TO JOIN A BUBBLE FIGHT! Bobble through ninety-nine magical worlds with our brontosaurus buddy, looking for wondrous treasures and daring adventures, (not to mention a ton of fun!). You have to battle foe after foe, bust just face each and blow! Trapped in your bubbles, the enemies are helpless till they escape - and when they do, they'll come after you! So hop on a bubble and float far away, to find secret rooms and special surprises. Whoever thought that just blowing bubbles could help you defeat all your troubles! 08-31-2018 aliensstudios Box Text BUBBLE BOBBLE TAKE A DEEP BREATH AND HOLD ON TIGHT - YOU'RE ABOUT TO JOIN A BUBBLE FIGHT! Bobble through ninety-nine magical worlds with our brontosaurus buddy, looking for wondrous treasures and daring adventures, (not to mention a ton of fun!). You have to battle foe after foe, bust just face each and blow! Trapped in your bubbles, the enemies are helpless till they escape - and when they do, they'll come after you! So hop on a bubble and float far away, to find secret rooms and special surprises. Whoever thought that just blowing bubbles could help you defeat all your troubles! 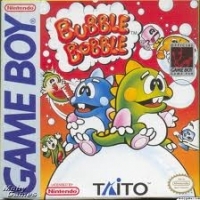 This is a list of VGCollect users who have Bubble Bobble (Taito) in their Collection. This is a list of VGCollect users who have Bubble Bobble (Taito) in their Sell List. 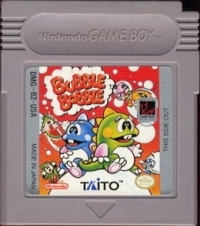 This is a list of VGCollect users who have Bubble Bobble (Taito) in their Wish List.